All this week the Los Angeles Philharmonic is presenting programs in a mini-festival under the moniker “Sublime Schubert.” And while the powers that be in our beloved local orchestra have a penchant for some hyperbolic and outright non-sensical marketing slogans (Schubert doesn’t require unbinding apparently), this is one instance where the series title couldn’t be more fitting. But that isn’t necessarily just due to Schubert. Oh, it’s profoundly beautiful music, but the sublime part really rests in the hand of two artists who’ve left jaws gaping at the Walt Disney Concert Hall on Monday and Wednesday this past week – pianist Christoph Eschenbach and bass-baritone Matthias Goerne. Now Goerne is world-renowned and he’s appeared here in Los Angeles before. In fact he’s even sung some of the same Schubert pieces here before including the song cycle Winterreise with Alfred Brendel in 2004, which surfaced again on Wednesday’s program. And yet none of that prepared me for just how intensely unmooring these two shows, which also included Schubert’s Die schöne Müllerin on Monday were. Goerne has unearthly beautiful phrasing, meticulous control, masterful dynamics and power to burn. This goes without saying. He’s also known as a vocalist who doesn’t so much sing with accompanists as perform with other top tier pianists in collaborative projects. 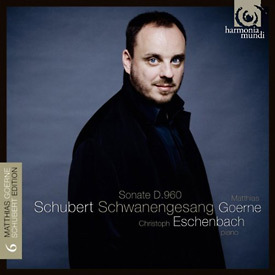 A number of these have been recorded over his career, and Goerne and his current collaborator, Eschenbach are currently in the midst of a major recording of Schubert’s songs for Harmonia Mundi. This well regarded series recently increased by one with the release of Goerne’s second go at Schwanengesang last week. They are all wonderful recordings that highlight what the live audiences discovered here: Goerne is a modern master of Lieder, but the combined artistry of these two performers raise the stakes to something much, much greater. Take Monday’s performance of Die schöne Müllerin. This pastoral series about a young man who falls in and out of love with the miller’s daughter is undoubtedly beautiful but can bear a reputation as being quaintly youthful and oafish. 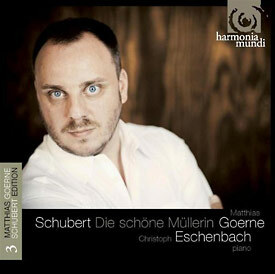 Not so on Monday when Goerne and Eschenbach not only transcended any negative stereotype of the work, they produced a song cycle that was nothing short of operatic in its proportions. A friend of mine described the experience as akin to listening to Wozzeck. The motifs that recur and change over the course of the cycle took life as grand leitmotifs in their own right. The non-stop emotional drama of the work demanded the kind of rapt attention that musical theater does at its grandest and very best. I’d give you specific highlights, but it would be pointless. Each and every song was filled with such perfect shape, such pristine, focused emotion that any moment could bring tears to your eyes. Of course, Winterreise, which sort of picks up where Müllerin leaves off, is much darker fare. The already spurned lover slowly descends into madness until he is haunted in the almost chant-like closing “Der Leiermann” by a spectral organ grinder calling the protagonist into a world he will never return from. Show flew with Goerne and Eschenbach working together, sometimes almost at the total exclusion of the audience, as they carved out that dark wintery space of the soul. All of this drove home on of the things I most love about classical music. It has nothing to do with relaxing, or escape, or even being transported from somewhere to somewhere else. It’s about artists’ ability to take something familiar, and with often relatively few changes to the source material, create something unfamiliar and new. When that new product is something as surprising and shocking as these recital were it suddenly makes the whole endeavor of listening into something more mysterious and precious. Goerne and Eschenbach delivered just and will hopefully continue to do so into the weekend when they’ll appear alongside the full L.A. Phil for more Schubert songs this time arranged for a full orchestra starting today. Don’t miss this one.